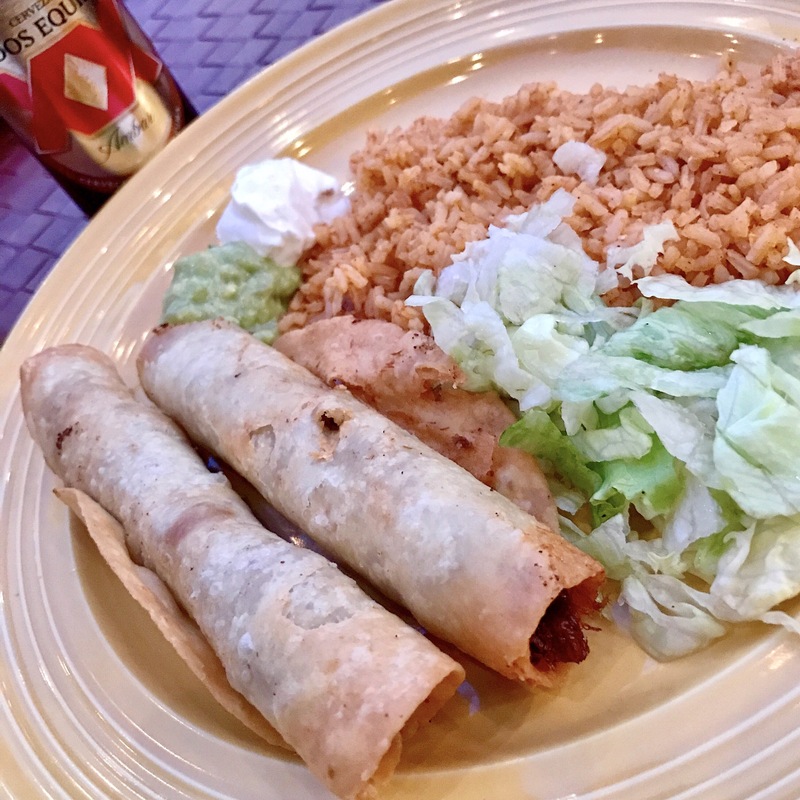 One of the best things to order at Mi Ranchito are these outstanding flautas! Some of the best in town. Also tried a papa taco, (potato taco), or as I like to say, “tater taco”. Not one of the best things to order. Didn’t really care for the consistency of the potato. It seemed like pieces of mashed up, bland baked potato. I think if it were chunks of diced up, fried, crispy potato it would have been better. Certainly a beautiful looking taco though! I’ve eaten flautas all over town and I’m happy to say that none have been terrible. Flautas at La Cocina however have been a remarkable standout! Standard order of two (beef or chicken) is only $4.99 and comes topped with shredded cheese, sour cream and an excellent, fresh tasting guacamole. I usually order beef, but this time tried the chicken. These were rolled up with a ton of seasoned, shredded chicken. Probably the chubbiest flautas I’ve had it town. Outstanding service, as always, at La Cocina. Another outstanding order of flautas at Mi Ranchito! I ordered two for $4.50. You can get them individually for $2.25 each. 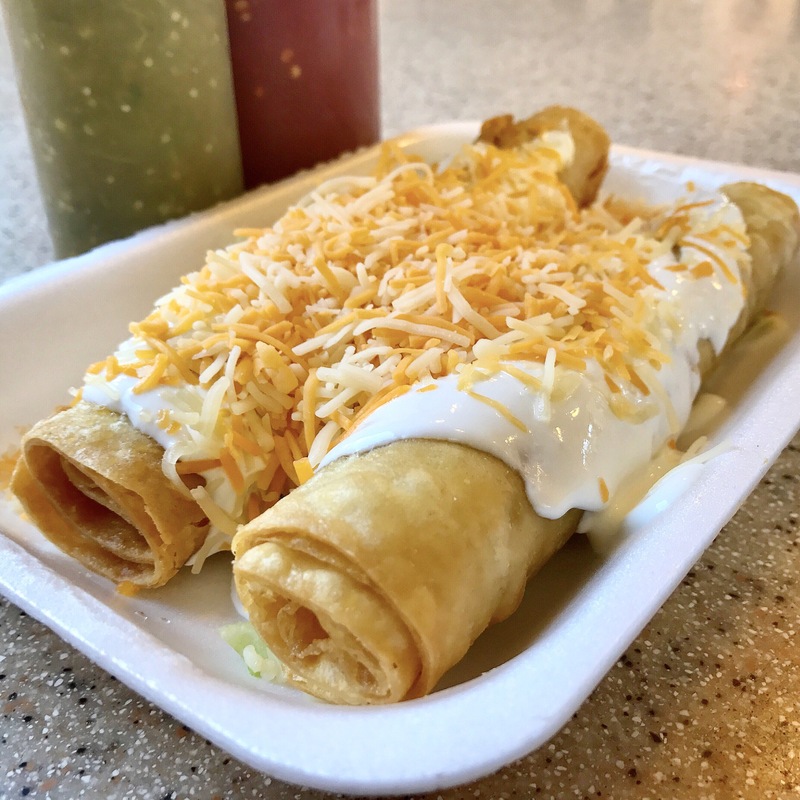 The flautas rest atop a bed of shredded lettuce, then are topped with sour cream and shredded cheese. The whole thing is served on a narrow foam tray. For decades I’ve eaten flautas at various taco shops throughout SoCal and these are pretty average sized. I’ve been to some places where they come out looking like small chimichangas! Here at Mi Ranchito they tasted just fine and two filled me up. They are filled with a fairly conservative amount of tender shredded beef. Tortilla was nice and crispy; they were not at all greasy. I thought the amount of sour cream on top was reasonable and appropriate. Any more and it would have turned into a hot mess. Mi Ranchito has been under fire recently so I decided to go there for breakfast this morning. I’m not going to get into the merit of all the criticism because people have their own opinions, standards, expectations, etc. and I respect that.I ordered two beef flautas for $4.50. You can get them individually for $2.25 each. 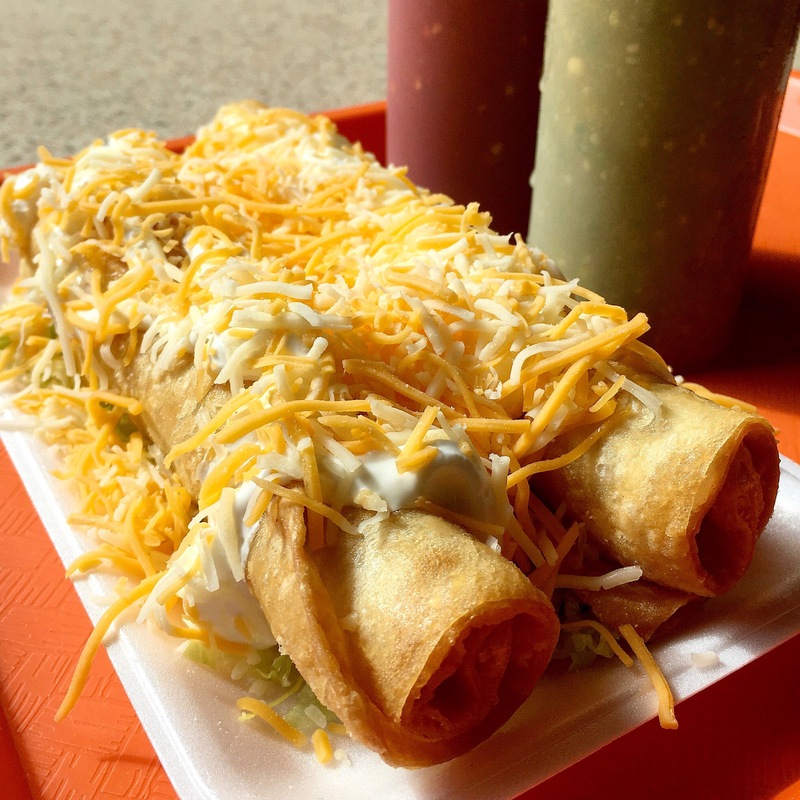 The flautas rest atop a bed of shredded lettuce, then are topped with sour cream and shredded cheese. The whole thing is served on a narrow foam tray. The young lady behind the counter this morning was very nice. No issue at all with the service today. I have noticed them to be somewhat surly in the past. 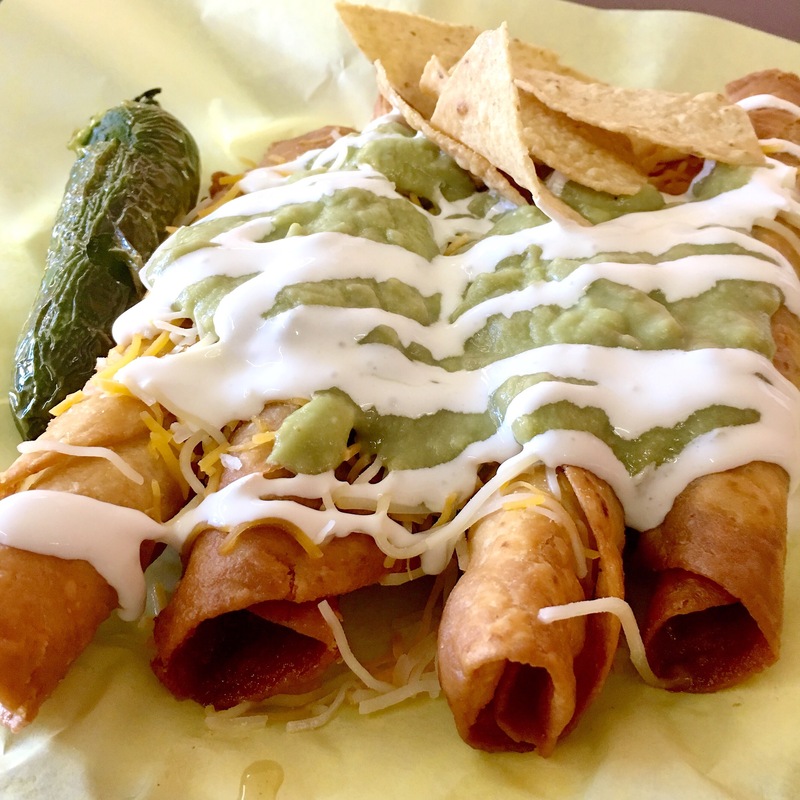 The other day for breakfast I got a big league order of flautas from El Taco Loco Shop inside Ramona Market. It’s a great value – four chubby, beef filled, flour tortilla wrapped, fried flautas for only $4.99. There’s no standard topping method here, they always ask what I want on top… So I just tell ‘em cheese, crema and guac. They come out hot, crispy and tasty! I always recommend eating in here at one of their rickety tables. To me the food always tastes better that way. I’m a big flauta fan and saw in another post today that Mi Ranchito has good flautas. Never tried them there. All recommendations welcome!